The economic outlook in the countries of Central East and Southeast Europe (CESEE) will improve in 2015–2017 with the forecast average economic growth rate close to 3% – some 1.5 pp. higher than the expected euro area average growth. Only the CIS countries and Ukraine will be an exception to this trend. Household consumption, aided by labour market improvements and low inflation, will be the main driver of growth. These are the main results of the newly released medium-term macroeconomic forecast by the Vienna Institute for International Economic Studies (wiiw), revising slightly upwards the growth projections relative to the Spring 2015 forecast. Sub-regional growth trends vary greatly. At one end of the spectrum, the Central European countries are expected to continue their robust recovery with growth rates in the order of 2-4% per annum over the forecast horizon (2015–2017). At the other end, the prospects facing the CIS countries are particularly poor unless global commodity prices recover, both Russia and Belarus already tumbling into a deep recession (expected growth in 2015: -3.7% and -3.8%, respectively), while Kazakhstan is following suit with a deceleration in growth (1.5% in 2015). Whereas economic activity in the Baltic countries suffered this year on account of their exposure to Russia, they appear to be resilient and recovery is still on track with growth in the medium term expected to be in the range of 1.5-3%. Overall, Southeast Europe displays improving, but irregular growth tendencies, in many cases accompanied by macroeconomic imbalances and deep structural problems. Serbia and Croatia, the worst performers in the group, will enjoy hardly any growth at all in 2015 (0.1% and 0.7%, respectively), while growth in other countries will be in the order of 2-4%. The situation in Ukraine remains particularly fragile and serious downside risks persist, although there are signs that the recession, much deeper than originally anticipated (with output projected to drop by -11.5% this year), might be bottoming out. Net exports are providing only a limited, if at all positive, contribution to growth, while household consumption, supported by labour market improvements and low inflation due to weak commodity prices, is coming to the fore as the main engine of growth across most of the CESEE region; consumption is expected to remain among the key drivers in the medium term as well. At the same time, private investment remains the much-needed missing link in the mechanism essential to rekindling sustainable output growth in the CESEE region, and public investment may prove to be an important complementary factor. In this regard, the EU structural and investment funds under the 2014–2020 Multiannual Financial Framework will be instrumental as a source of co-funding. Inflation remains very weak across the CESEE region, hovering at near-zero levels on account of low commodity prices, with the exception of the CIS countries, Turkey and Ukraine, whose inflation spiked owing to exchange rate pass-through effects that followed sharp currency depreciations in 2014–2015, as well as country-specific factors, such as the food embargo in Russia and the rise in utility tariffs in Ukraine. The external environment is only moderately supportive. As the multi-speed recovery of the world economy continues in 2015, driven primarily by advanced economies and accompanied by poor performance in large emerging market economies, manifold external risks also arise that could jeopardise the recovery of the CESEE region, including geopolitical tensions associated with the situation in Ukraine and the Middle East, a slowdown in major emerging markets, normalisation of monetary policy in the USA and low commodity prices (a negative shock for the CIS group). Special sections of the forecast report focus on some of the potential risks that have attracted much attention since the beginning of the year, including the refugee crisis in Europe, recession and import-substitution policy in Russia, the Volkswagen scandal, the economic slowdown in China and the implications of the Greek crisis. With the exception of the CIS countries and Ukraine, however, the CESEE countries appear to be rather resilient to date. 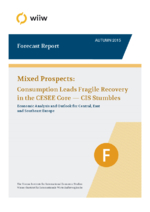 Mixed prospects: consumption leads fragile recovery in the CESEE core - CIS stumbles.